A major destination for visitors to IBC, the IP Showcase is a demonstration to the broadcast and media world that real-time IP production is a practical, flexible and highly efficient reality, rapidly taking hold in mainstream operations. IP is no longer a “future” — it is here and now. The IBC IP Showcase will present real-time IP for production, playout, and contribution as a practical, flexible, and efficient reality that is rapidly taking hold in mainstream broadcast operations. More information and a complete schedule is available at https://show.ibc.org/ibc-features--events/ip-showcase. More than 40 vendors will work together to demonstrate real-world IP interoperability based on SMPTE ST 2110 and AMWA NMOS specifications — a single, common IP interop standard that is unleashing the full potential of IP in real-time media. To prove ease of use as well as interoperability, the demonstrations are divided into logical application pods — live production signal flows, contribution and playout signal flows, etc. — all shown under the control of familiar user interfaces. IBC2017 opens in three days at the RAI Exhibition Centre in Amsterdam. As of today we feature 100 IBC related stories (about the exhibition and the conference). This list is continuously updated. 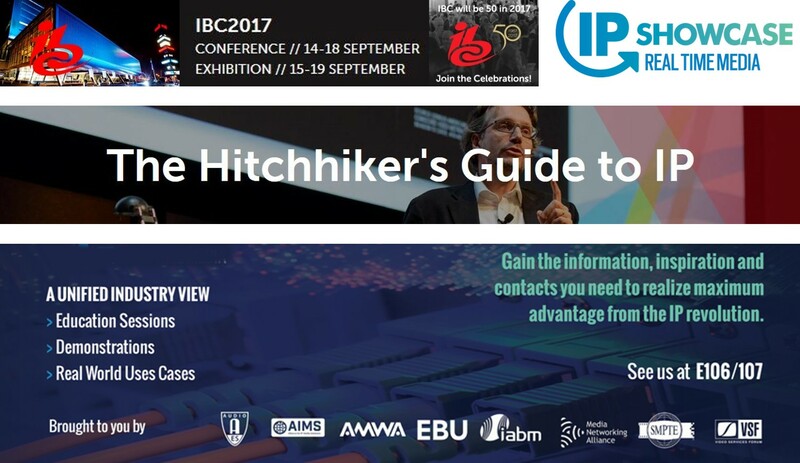 The link "IBC2017" will always show you the featured companies and events in alphabetical order. “UHD1”, commissioned by technology and production center switzerland ag (tpc) a subsidiary of SRG SSR and Switzerland's leading broadcast service provider, will soon emerge from sonoVTS’s facility in Munich as the world’s first totally IP truck, running uncompressed video and audio data throughout its production workflow. According to sonoVTS Head of Business Development Manager Toby Kronenwett, “tpc really wanted to build a truck that is on the edge of what is technically possible. It’s been a very exciting project for us, for tpc, and for other manufacturers involved. But it’s not been without its challenges, the primary one being that it was completely new territory for everyone. Arena continues to pioneer by introducing the world's first IP-based UHD High Dynamic Range OB fleet. The new triple-expands (OBX, Y & Z) all feature UHD/HD/SD multicast technology. They are based around a powerful IP core developed in association with Grass Valley and Cisco. Arena holds contracts with the UK's major broadcasters to provide coverage of events, music, large studio shows and sport. Arena is a Telegraph 1000 business that has remained in continuous family ownership for approaching 30 years. Timeline’s state-of-the-art IP 4K HDR outside broadcast truck is one of the most advanced in the world. With an Arista 100G switch at its heart and SAM IP infrastructure UHD1 (see UHD2 at SAM's IBC booth#9A01) delivers large scale complex OBs simultaneously in uncompressed 4K UHD HDR and 4K UHD SDR. IP technology removes traditional SDI matrix limits enabling production teams to fully harness the power of UHD 4K. UHD1 is based around the SMPTE 2110 standard enabling both audio and video to be processed in the IP stream. We had a closer look to new HD/UHD OB trucks and are happy to present 25 trucks in quite detail. The presentations include trucks from Arena TV, EuroMedia, Express, Fuji Media Tech, Gearhouse Broadcast, GH ONE, HD Resources, Hessischer Rundfunk, Levira, Mobile TV Group, NEP Australia, NEP Norway, NEP Switzerland, NEP USA, NVP, Point2Point, RTM, SBS, Televizia Markiza, Timeline\TV, Turkmenistan and TV Globo. In addition, we cover stories on the future of the OB Truck, on some learnings of building 4K trucks, the first 4K truck in Sri Lanka and a SNG for ORF incorporating internet, video/radio production and IP streaming. These presentations are accomplished by the making-of high-end sports and show productions like America’s Cup or the Eurovision Song Contest. PURE LIVE 2017 has a volume of 200 pages. Grass Valley, has supplied Studio Berlin, a German full-service provider for live television production solutions, with a suite of equipment for its outside broadcast (OB) trucks and TV production studio facilities, including 41 LDX 80/82/86/86N Series Cameras and LDX C80 Compact Series Cameras plus six K-Frame Video Production Center switchers capable of producing in 4K UHD. The camera purchase is part of a three-year contract with Grass Valley. Studio Berlin is planning to substitute a significant total of 70 LDK Cameras with the new LDX models within that period. Following its investment in several XT4Ks earlier this year for its new 4K production trucks, NEP Switzerland is again deploying the live production servers – alongside several other EVS solutions. This technology drives end-to-end UHD-4K production inside a new broadcast center built in Zurich by NEP for the recently-launched Swiss MySports channels, which are owned by UPC Switzerland, the country’s largest cable television operator and subsidiary of Liberty Global. NEP also provides MySports with operational services for the new broadcast center, which includes two studios, three control rooms (one dedicated to the production of highlights from the games being broadcast), post-production and playout facilities. Broadcast specialist CROSSCAST, who was brought in to provide the technical infrastructure and editorial direction for the live talk show, opted to implement a workflow built around the ATEM 2 M/E Production Studio 4K switcher, Smart Videohub 20x20 router and HyperDeck Studio Pro broadcast decks. Mounted on a studio pedestal and paired with a URSA Studio Viewfinder and HD B4 lens from Canon or Fujinon, each camera channel has full talkback and tally capabilities. CROSSCAST has also developed a bespoke OCP using Blackmagic’s 3G-SDI Arduino Shield and the ATEM SDK to provide remote camera control solution for color shading. The races broadcast live on TRT Spor and Istanbul Web TV live were held on a 4 kilometers course. HD wireless transmission systems were used within 6 kilometers area. Besides two cameras installed on a zodiac boat, wireless systems installed on a 8 prop drone were used to transmit the races to the audience flawlessly. The two hours production was realized with 8 fixed cameras installed at the start and the finish. The graphics services for the broadcast were also provided by ACTAMEDYA. ACTAMEDYA has been providing turn-key solution broadcast services, besides football, basketball, for sports such as; cycling, athleticism, motorcycle, swimming, sailing, triathlon and car races. To create the most engaging live viewing experience for the 2017/2018 season of Germany’s Bundesliga – one of the most-watched football leagues in the world – multiple broadcasters and facilities providers have invested in new technology from EVS. By deploying the latest technology – from live production servers to live video switchers – these organizations can benefit from the industry-leading speed and reliability of EVS technology to create the best live programming for the league’s fans. Lighting Designer LeRoy Bennett is tasked with highlighting “a vast array of musical styles over the decades” during the course of the three-hour show. High-tech AV solutions, including layers of transparent video, LEDs and lasers, form a backdrop for the history of the former Beatle’s music but remain unobrustive to fans. “While we use many aspects of technology you never see them all at once, and they are never overpowering,” notes Lighting Director Wally Lees. Upstaging provided the tour with 12 Claypaky Scenius Profiles, 12 Scenius Unicos and 96 Sharpys. The versatile Unico spot, wash and beam light is making its debut with McCartney’s show. Cool, credible and creative, Chance the Rapper is enjoying plenty of popularity and critical comment in general, and on his past US tour in particular, which featured an eye-catching show designed by another rising star in our own industry, Michael Apostolos. Like the artist, Michael is also based in Chicago. They met through Chance’s management team four years ago, when Michael started as LD, and he is now the creative director as both their career trajectories have soared. Michael put Robe moving lights right at the heart of the “Be Encouraged” tour, specifying 30 x BMFL Spots, 4 x BMFL WashBeams and 56 x LEDWash 1200s as well as 8 x CycFX 8s for the tour, all supplied by rental specialist, Solotech. Capital supplied two trucks of equipment, including the bulk of the MLA, MLD, MLX and MLA Compact enclosures, while Martin Audio’s Polish partners, Musnicki, provided the remainder of Martin Audio’s flagship PA for the 25th edition of this landmark event. Featuring daily capacity crowds of 90,000, the event is dubbed the Island of Freedom (due to its picturesque location on the Danube). In addition to main stage, Martin Audio premier PA systems once again featured on the Colosseum and Europe stages, courtesy of the manufacturer’s Hungarian partner, BG Event. Capital Sound have worked the event almost continuously for 12 years and MLA has featured for the past three. Fusing AJA’s production-proven FS frame synchronization and conversion technology with video and color space processing algorithms from the Academy and Emmy Award-winning Colorfront Engine™, FS-HDR matches the real time, low-latency processing and color fidelity demands that broadcast, OTT, post production and ProAV environments require. FS-HDR offers two modes for comprehensive signal conversion, and allows users to also convert a range of camera Log formats to HDR broadcast standards as well as to/from BT.2020/BT.709. FS-HDR’s single-channel mode, with extensive HDR and WCG support for 4K/UltraHD/2K/HD/SD processing, enables up, down and cross-conversion, including real time down conversion of 4K/UltraHD HDR to HD HDR or SDR. LiveU is extending its Solo product line of professional-grade wireless video encoders to accommodate the growing needs of online content creators streaming to social media and other online destinations. The full product-line will be on display at IBC2017 (stand 3.B62). The enhanced portfolio offers Solo customers an affordable, easy to use, single interface to produce flawless online productions by adding features such as real-time graphics. The LiveU Solo portal user interface, accessible on any web-enabled device, has also been upgraded and offers a more intuitive and streamlined workflow. VENICE was officially unveiled globally on 6th September with events in Europe at Sony’s Digital Motion Picture Centre at Pinewood Studios with renowned cinematographer Ed Wild B.S.C., and in the USA at the Cary Grant Theater, Sony Pictures Studios. At both events Sony will also screen footage produced with the new camera, directed by Joseph Kosinski and shot by Academy Award winning cinematographer Claudio Miranda, ASC. “The launch of VENICE demonstrates our strong relationship with filmmakers around the world, and our commitment to developing tools that support directors, DOPs and cinematographers in bringing their vision to the screen as they originally intended it,” said Sebastian Leske, Product Marketing Manager, Cinematography, Sony Professional Solutions Europe. Developing, delivering, and using a new technology like VR isn’t easy; but gawk, is it fun. At IBC, we’ll see – and hear from – people who can see it, almost touch it. And we’ll hear a ton of naysayers. They’ve forgotten that: Silent movies lasted from 1895 – 1936, B&W TV started in 1928, The first U.S. color transmission was in 1954 (Tournament of Roses) but B&W reigned for another dozen years, Not a lot of color TV sets sold back then. Why? Lack of content, high cost of production and lack of viewing screens. The M&E industry has a lot of challenges, issues, opportunities on its plate but the Amsterdam event (Sept 14-19) is focused on helping the industry be prepared to prosper in the next 50 years. And if that isn’t enough, there’s the SMPTE (Society of Motion Picture and Television Engineers) conference a month later in Hollywood.